The most dramatic feature of the landscape along the northern portion of the Nemasket River at Purchade is the unique ox-bow bend made by the sharp turning of the river which flows northwards, then southwestwards, then southeastwards where it comes within some 350 feet of doubling back upon itself before finally turning westwards towards its confluence with the Taunton River. In the process, the river circumscribes a 22 acre triangular-shaped parcel of upland fringed with swampy ground. The land defined within this ox-bow bend is historically known as Lyon’s Neck, four generations of the Lyon family having owned land there from about 1730 through 1821. The comprehensive Lyon Memorial genealogy in 1905 noted the long association between the family and Lyon’s Neck, remarking “traditions of the ‘Ox-bow’ linger still among the descendants of Samuel [Lyon]”, the original settler. Sadly, the editors of the volume do not elaborate on what those traditions were, though they were no doubt rooted in the family’s unusual geographic situation, a large portion of their land being nearly surrounded by the Nemasket. Little is known of the pre-Contact history of Lyon’s Neck. According to Maurice Robbins’s 1973 map Middleboro Purchases, the area between the Nemasket River and Purchade Brook (including Lyon’s Neck) was known to the Native peoples as Tepikamicut. This land was included as part of the Purchade Purchase, the second purchase made from the Native peoples in Middleborough. Completed in 1662, the Purchade Purchase was subsequently divided into lots running perpendicularly to the Nemasket River with the area of Lyon’s Neck being set off as the fourth lot to Peregrine White (1620-1704), the first known English child born in America. Though the area Lyon’s Neck is today fairly remote, uncrossed by roadways other than old woods roads, in the early 17th and early 18th centuries, it was visited more regularly. A 1742 deed makes note of the remains of an “old house” situated near the Nemasket River on what was probably the adjoining third lot of the Purchade Purchase as well as a “way [that] goes down the bank [of the river] to the old fishing stage or fishing place”, indicating the close connection between the first settlers and the Nemasket River which served as both a transportation route and a source of fish. The fourth lot of the Purchade Purchase passed through a number of hands until late 1730 when the northernmost 70 acres came into the possession of Samuel Lyon (1679-1756) of Roxbury, Massachusetts, who purchased the property from Benjamin White of Middleborough for £545. Notably the 1730 title deed records the boundary as following the Nemasket River “ down stream round the Neck”. Lyon removed to Middleborough and was settled enough to join the First Church of Middleborough on January 23, 1732, constructing a house about one-third of a mile south of the neck in an area of meadows. On March 16, 1750, Samuel deeded his 70 acre farm at "Purchade Neck, Middleboro (the ‘ox-bow’)" to his son, Jedediah Lyon (1721 - 1807), for £100. The deeded land included the entire 22 acres on Lyons Neck, another 20¾ acres of woodland immediately to the south, 18½ acres of cleared land south of the wooded tract that was the site of the Lyon homestead and was later set off as a dower lot for Vinal Lyon’s widow Chloe (Richmond) Lyon, and still further south several acres of swampland in what was known as Lyon or Lyon’s Swamp. 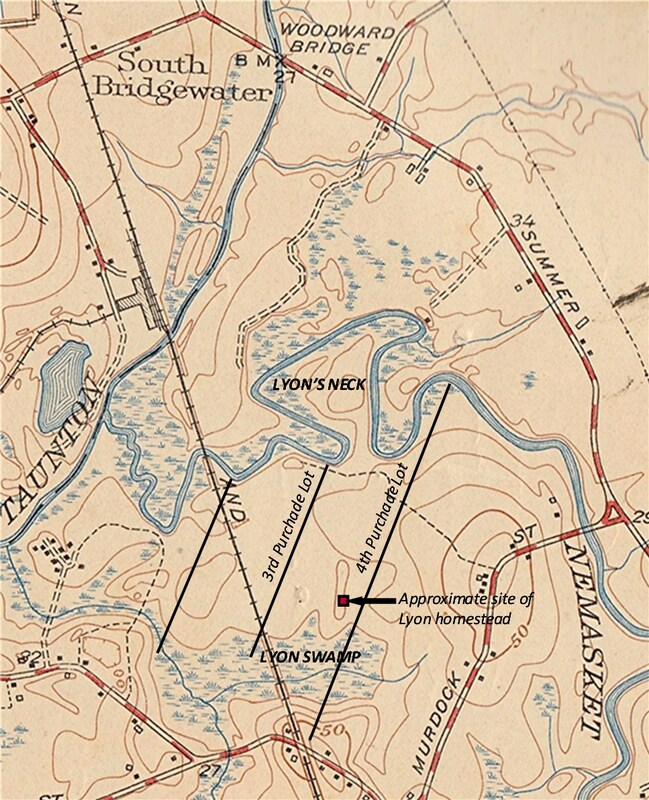 The lands at the neck were an important part of the homestead farm of Jedediah Lyon whose grandson Isaac Lyon noted that the portion of the farm lying along the Nemasket “was known by [name as] the neck” with the western portion (the furthest downstream) being known as the “lower neck” and the eastern portion further upstream as the “upper neck”. Though the use to which the neck may have been put is not recorded, it is possible that it was used as pasturage for cattle, the nearly complete circuit of the river forming a natural barrier to keep cattle from straying. There is a record dating from 1821 of a fence running across at least the eastern portion of the neck down to the river, giving credence to the thought that the neck was used for livestock. One of the earliest if not the first recorded appearances of the name “Lyon’s Neck” is in a deed written in 1825 indicating that the feature was clearly known by this name at the start of the 19th century, if not earlier. By 1904, the name had become well known enough that in the valuation list of Middleborough properties that year, the land at the neck then owned by Earl H. Cushman of Bridgewater could be listed simply as “Lyons Neck Lot”. With the decline of the Nemasket as a transportation route, access was provided to the neck by woods roads. When Samuel Lyon purchased the property in 1730, he also acquired the right to use “a cart way from said tongue meadow unto the highway that leads to the causey [causeway] called Samuel Eaton’s causey.” In 1821 when the upper neck was sold to Solomon Alden of Bridgewater, Alden was granted “the privilege of going with the team from the highway to and from said lot through gates and bars…”. Later U. S. G. S. survey maps indicate a roadway that connected the neck with Murdock Street, though the original approach may have been from Plymouth Street near White’s Hill. The distinctiveness of the Nemasket ox-bow at Purchade notwithstanding, it does not appear on maps until 1855 when it is clearly depicted on Walling’s map of Middleborough of that year. Despite the inclusion of Lyon’s Neck on the map, Walling misidentified it, labeling instead as Lyon’s Neck the area on the opposite bank of the river. The neck remained in the possession of the Lyon family until the first quarter of the 19th century. In 1810, Isaac Lyon, Samuel Lyon’s grandson, sold the westernmost 10 acres or lower neck to Captain Nathaniel Bump/Bumpus of Middleborough. Fifteen years later in 1825, Seth Eaton, Jr., administrator of the estate of Vinal Lyon (1762-1819), Jedediah’s son, sold the remaining acres at the upper neck to Solomon Alden of Bridgewater. Since that time, Lyon’s Neck has largely been abandoned. Tracts to the south and southeast were utilized well into the 20th century as woodlots including lands later owned by Ezra Morse and jointly by Luther B. and Silas H. Murdock. Map of Lyon's Neck, Middleborough, MA. The base map is U. S. G. S. survey map, Bridgewater Quadrangle, 1940. Facsimile of Samuel Lyon's Signature from the Lyon Memorial (1905). 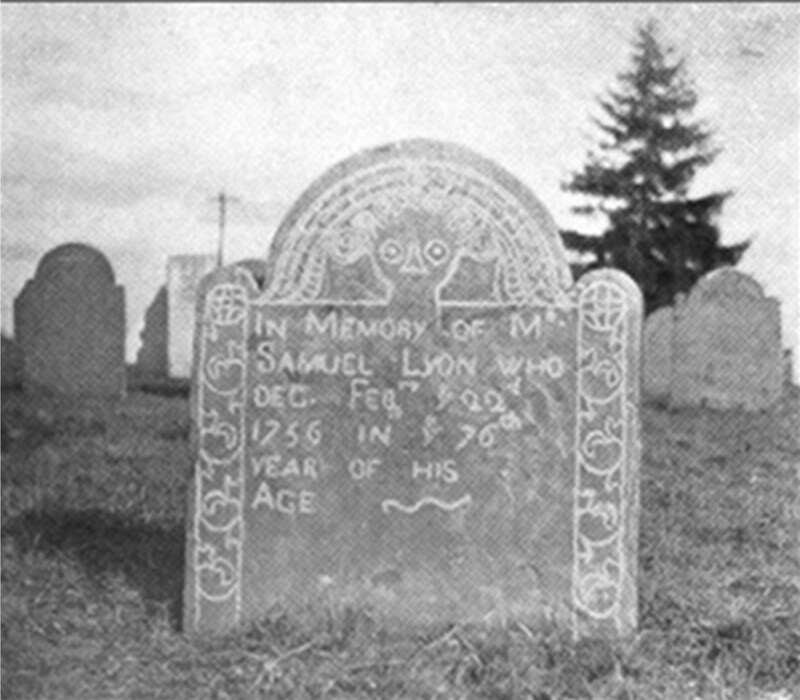 Samuel Lyon Grave Stone, Purchade Cemetery, Middleborough, MA. The image first appeared in the Lyon Memorial (1905). Kinnicutt, Lincoln Newton. Indian Names of places in Middleborough, Lakeville and Carver, Plymouth County, Massachusetts, with Interpretations of Some of Them. 1909. Lyons, A. B. and G. W. A. Lyon, eds., Lyon Memorial. Detroit: privately published, 1905. Plymouth County Registry of Deeds 29:41, 35:36, 41:64, 115:124, 144:200, 155:104, 296:241. Robbins, Maurice. Middleboro Purchases. 1973. U. S. G. S. survey maps, Bridgewtaer Quadrangle, 1940, 1962, 1977. Walling, H. F. Map of the Town of Middleborough, Plymouth County, Mass. 1855. Walling, H. F. Map of the County of Plymouth, Massachusetts. New York: D. R. Smith & Co., 1857. Will this be published in any of your volumes? Someday it may work its way into a history. I'd like to do additional research on the area since it appears to have been quite an active little spot during the colonial era.